Greetings again from the darkness. In an effort to be helpful to potential viewers, it’s customary to provide a synopsis that allows for a quick determination on whether this “type” of movie will hold appeal. The problem is that this debut from writer/director (and novelist) S. Craig Zahler can be encapsulated with a simple: four local men from a small, dusty old West town head out on a rescue mission to face a tribe of cannibal cave-dwellers. Unfortunately, that analysis doesn’t cover the originality and genre-twisting of this Western-Horror film featuring crisp and funny dialogue, plus some of the most extreme brutality ever witnessed on screen. A very deep and talented cast milks the script for every possible chuckle, moan, shock of pain, and queasy squirm. 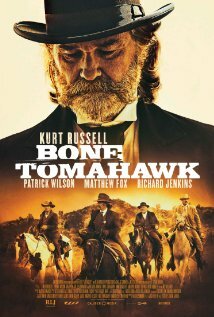 Kurt Russell stars as Franklin Hunt, the sheriff of the ironically named town Bright Hope. Though a long-time fan of Mr. Russell, I’ve often been critical of his career-limiting role choices, and here he proves yet again that he has always been capable of taking on a challenging lead and delivering a nuanced performance. He is joined in the rescue posse by his “back-up deputy” Chicory (Richard Jenkins), the abducted woman’s injured husband Arthur (Patrick Wilson), and a nattily attired gunman (Matthew Fox). The opening sequence featuring outlaws Purvis (David Arquette) and Buddy (horror vet Sid Haig doing his best Slim Pickins imitation) sets the stage for the brutal violence to come in the third act, as well as the film’s crackling dialogue that’s clearly influenced by The Coen Brothers, Quentin Tarantino, and Elmore Leonard. There are also brief but memorable supporting roles from Kathryn Morris (as the Sheriff’s wife), Michael Pare’ (as a self-centered stable owner), James Tolkan (as an uninspired piano player), and Fred Melamed (as the barkeeper). Lili Simmons (“Banshee”) has a key role as the abducted Samantha O’Dwyer. An odd blending of John Ford’s The Searchers and Wes Craven’s The Hills Have Eyes, a substantial portion of the (long) run-time is dedicated to the slow trail ride/walk of the four men as they track the “troglodyte” tribe in hopes of rescuing the captured folks. The focus on these four men: the duty-bound Sheriff, the overly loyal deputy, the emotionally-driven husband, and the vengeful gunslinger, is an old West character study dressed up with some fancy oration. In fact, the excessively-perfect English sits in stark contrast to the other-worldly tribal wailings of the cave-dwellers who seem to have no real language at all. It’s an unusual film that defies a simple synopsis, and certainly won’t appeal to all movie goers. A viewer must enjoy the prolonged journey and the interaction between the distinctive personality types (Jenkins is a particular standout in a Walter Brennan-type role), and also have an affinity (or at least a constitution) for gruesome brutality. The film is only receiving a very limited theatrical release, but should find an audience via VOD. This entry was posted on Sunday, October 25th, 2015 at 6:43 pm and is filed under Horror, Western. You can follow any responses to this entry through the RSS 2.0 feed. You can leave a response, or trackback from your own site.